Hunter’s Honey Farm is a family owned and operated farm. We are a fourth generation of beekeepers who have been producing honey and honey related products in Indiana for over 100 years. Gilbert Perigo was born in 1890 and caught his first swarm while he was in high school in Boonville, Indiana. By 1910, he was managing several hives to pollinate his father’s apple orchard. He eventually built his apiary to 800 hives while at the same time teaching school. In 1951, he retired from teaching. Then he took on the position of Chief Apiary Inspector for the Indiana Department of Natural Resources and moved his apiary and family to Mooresville, Indiana. He and his wife Elizabeth raised 5 girls of whom Marian was the eldest. Marian married Max Hunter (an engineer for the Indiana Highway Department) and began teaching elementary school in Mooresville. She eventually began her own apiary of approximately 12 hives. Her and Max had three children of whom Tracy was the youngest. Tracy grew up helping his grandfather (Gilbert) harvest and extract the honey. It was then sold in local stores, orchards and from their front porch. In June of 1975, as a sophomore in high school, Gilbert helped Tracy hive his first swarm in downtown Mooresville. 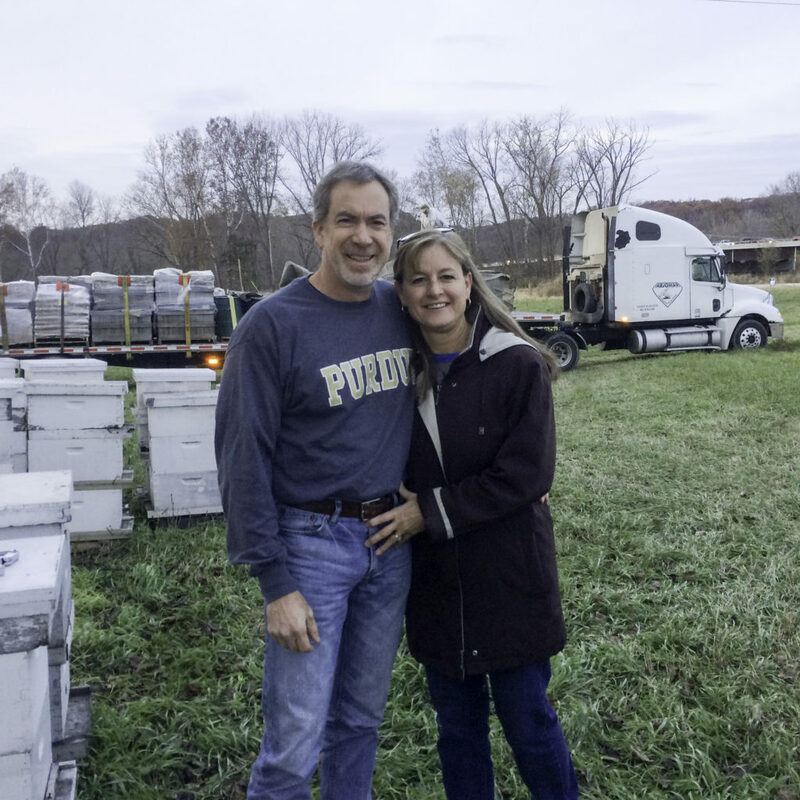 After graduating from Purdue University, Tracy married Christina Ramsay and together they continued adding to the apiary reaching 500 hives in 1998. During the Spring of 2004, Tracy helped 10 year old Ross hive his first swarm in Martinsville, Indiana. For the last few years, Ross has been our number one queen grafter. Today, the Hunter family along with Beekeepers Tony and Sarah, manage several hundred hives throughout the state. Our honey bees pollinate apples, melons, strawberries, pumpkins, and other similar crops. In addition to working with the bees and Christmas trees, Tracy is an Elder and Sunday school teacher at the Eastview Christian Church in Martinsville. Christina is a middle school family and consumer science teacher at the Indian Creek Middle School in Trafalgar. Mackenzie is headed to Purdue University to study biochemistry before pursuing her doctorate in wildlife veterinary science. And Ross is currently in Guinea, Africa serving in the Peace Corps. He is teaching local farmers and beekeepers how to improve their practices.